The only Russian aircraft carrier Admiral Flota Sovetskogo Soyuza N.G. 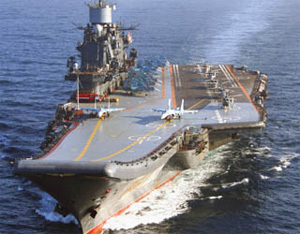 Kuznetsov will undergo modernization. Such reports emerged in media with reference to sources in the Navy. The ship is expected to be laid up in 2012 and recommissioned in 2017. Debates about necessity of aircraft carriers for our country have been in progress for decades now. First plans to build such ships occurred in 20's, but conditions of industry and economy in general had nothing in common with warships of this class. In 30's discussion round aircraft carriers appeared in the spotlight again and several more or less detailed projects were designed. They were getting to realization when WW2 hindered creation of the "large fleet". Thoughts to construct carriers arose again in the postwar period; it was planned to build first two ships in late 50's. However, the rise of Nikita Khrushchev who treated surface fleet with overt prejudice frustrated these plans again. Influence of "ideological factor" was also tangible; an aircraft carrier was declared a tool of imperialistic aggression and symbol of global evil. Any talks about building ships of this class for Soviet Navy had taint of mispersuasion. At the same time carriers still had adherents in Soviet political elite. Among them were defense minister Marshal of the Soviet Union Andrei Grechko, minister of shipbuilding industry Boris Butoma, and Navy Commander-in-Chief Sergei Gorshkov. The counterstand of Soviet system was very tight; in late 60's it was decided to begin with construction of heavy aircraft-carrying cruisers designed for VTOL aircraft Yak-38. Those ships looked like weird crossbreeds of aircraft carrier, missile cruiser, and large ASW ship. It was presumed that construction of first two cruisers would launch a full-fledged production of aircraft carriers. Positions of carriers' supporters were exploded after death of Butoma and Grechko. Dmitry Ustinov became a new defense minister; he disapproved an idea to build aircraft carriers. The works were in progress though. Several projects of carriers were deeply elaborated; shipborne equipment (catapults, arresters) and aircraft (deck-based versions of MiG-23 fighters and Su-24 bombers) were also designed. Fifth Soviet heavy aircraft-carrying cruiser became the most carrier-like ship. Laid down in 1982 as Leonid Brezhnev, launched in 1985 as Riga, renamed in 1987 into Tbilisi, and finally obtained her current name in 1990, the cruiser was dubbed in the West as "the ship with thousand names". In contrast to predecessors, the cruiser was originally designed for carrying standard takeoff and landing aircrafts, Su-27K and MiG-29K. Kuznetsov differed from average carriers in following parameters: smaller size of hangar (because of underdeck version of Granit antiship missiles) and absence of catapults making impossible to use heavy long-run aircraft (e.g. AWACS-type or deck-based transport aircraft). Besides, the ship's boiler-and-turbine powerplant had become obsolete in 80's, since all US carriers built after 60's were nuclear powered. In addition, the powerplant itself had poor design so Kuznetsov was spending much time under repairs. Nonetheless, the ship was commissioned and has become very useful for Navy in deck-based aviation development, elaboration of new tactics, and maintaining skills of counter-carrier warfare against potential enemy. Through her service Kuznetsov was several times nearly written off and sold for scrap, especially late 90's and early 2000's when the ship permanently stayed at the moorage wall. However, with improvement of economic situation in the country, the ship revived as well. Her powerplant and other shipborne equipment were repaired and the cruiser began to take the sea more frequently attending various maneuvers. Besides, since mid-2000's some political and Navy's leaders again raised a question of necessity to build aircraft carriers for Russian Navy. In such circumstances to keep Kuznetsov afloat was vital objective; the ship is essential to sustain personnel of deck-based aviation. Along with that, the necessity to eliminate "congenital" defects of the ship and need for overhaul suggested her large-scale modernization. Finally, persistent rumors that Kuznetsov would be laid up in 2010-2012 came true. What will the carrier look like? What sort of a ship will post-upgrade Kuznetsov become? It's hard to make an authentic forecast. Although having in mind bits and pieces of available information, it is possible to imagine future appearance of the ship. First thing subject to replacement is "dicky heart", the carrier's powerplant. Instead of boiler-and-turbine plant, Kuznetsov will obtain gas turbine power system or nuclear reactor. Shipborne arms will also see changes; in particular, Granit missile launchers will be removed. In combination with interior design, this will enable to enlarge hangar space up to 4,500-5,000 sq meters. Aircraft capacity of the ship will be significantly increased. AA weapons of Admiral Kuznetsov will be reinforced by replacement of Kinzhal SAM system with shipborne multipurpose medium-range SAM system with 80-120 missiles. As it was reported, short-range air defense will be provided by shipborne version of Pantsir SAM system (4-6 launchers). New weapon systems will be linked to state-of-the-art electronic equipment; most likely it is going to be Sigma Tactical Data System. It is unified for all new-gen Russian warships and provides previously unobtainable coordination level within ship formation. At last, installation of catapults would be absolutely logic. Considering that the ramp would be still in use, one or two catapults could be placed at angled deck, just like it was planned with non-built Soviet carrier Ulyanovsk. Soviet designers did develop steam catapults; the prototype was tested by NITKA training system, so this problem seems resolvable. Catapult selection depends on the ship's powerplant; steam catapults require nuclear plant and the only option for gas turbines would be electromagnetic catapults. Those have to be either developed or imported or…plagiarized. The most unambiguous aspect is Kuznetsov's prospective air group. It is already known that the carrier will be equipped with 26 new MiG-29K and helicopters. Apart of those aircraft, we could witness deck-based version of 5-gen T-50 fighters in the carrier's hangar. Probably, by the time of Kuznetsov's recommission (which will most likely happen in 2020 rather than 2017) 15-20 such aircrafts will be constructed.